Courtesy of East City Art! Gallery Underground – 5 p.m. to 8 p.m.
Glen Echo Park Partnership – 6 p.m. to 8 p.m.
Artists & Makers Studios 1 and 2 – 6 p.m. to 9 p.m. Corner Store – 6 p.m. to 9 p.m.
IA&A at Hillyer – 6 p.m. to 9 p.m.
Arts Club of Washington – 6:30 p.m. to 8:30 p.m.
VisArts – 7 p.m. to 9 p.m.
DC Arts Center – 7 p.m. to 9 p.m.
Arlington Arts Center – 1 p.m. to 3 p.m.
Wohlfarth Galleries – 4 p.m. to 6 p.m. Studio Gallery – 4 p.m. to 6 p.m.
Foundry Gallery – 5 p.m. to 7 p.m.
Susan Calloway Fine Arts – 5 p.m. to 8 p.m.
TAG/The Artists Gallery – 5 p.m. to 9 p.m.
Adah Rose Gallery – 6 p.m. to 8 p.m.
Yellow Barn Gallery – 6 p.m. to 8 p.m.
Gallery 102 – 6 p.m. to 8 p.m.
WAS Gallery – 6 p.m. to 9 p.m.
Washington Printmakers Gallery – 12 p.m. to 5 p.m.
Greenbelt Community Art Gallery – 1 p.m.to 3 p.m. The DC Downtown BID is seeking multi medium visual artists that can include but are not limited to Fine Artists, Street Artists, Graffiti Artists, Metal Workers, and Graphic Artists to design, submit and fabricate original designs to be installed on individual call boxes located in the Downtown area of the District of Columbia. Selected artists not currently residing in the District of Columbia will be required to have a District artist as a project assistant on the instillation. Each year, the Maryland State Arts Council (MSAC) recognizes outstanding artistic achievement and honors the contributions artists make to our state through the Individual Artist Awards (IAA) program. IAAs are accompanied by grants of $1,000, $3,000 or $6,000 to help support artists as they advance their craft. Applicants can access IAA guidelines, application, and application assistance resources by clicking the "Maryland" tab on MAAF's website. The curious case of "Negligence and Reputation Management"
While Werner Spies is an example of an individual brought to court over this tort, auction houses can also get sued for negligence. Take, for example, the case of Dickson v Christie’s in 2010. David Dickson and Susan Priestley sold “Salome with the Head of St John the Baptist” for £8,000 after an assessment by Christie’s determined the painting was from the school of Titian, and not the artist himself. However, Sotheby’s later sold the painting having assessed it as an original. It was put up for auction with a starting price of $4 million. Dickson and Priestley claimed Christie’s didn’t do the proper research in determining the painting’s correct origin and selling price. However, this case settled before trial. Our friends at the Hyattsville CDC are looking for artists to submit designs to be considered for their traffic box art project. Selected artists will be paid a $500 honorarium and will have their art displayed on a traffic box along a major thoroughfare. This call is open to ALL artists, graphic designers, illustrators, and photographers who currently live or work within the State of Maryland. Submitted designs must be original artwork. Art Walk reception: June 1, 6­8 p.m. Reception with artist: June 9, 6­8 p.m.
Stone Tower Gallery Hours: Sat.–Sun., 11 a.m.—6p.m. DC metro area artist Ric Garcia will exhibit new paintings, digital prints and mixed media works at Glen Echo Parks’ Stone Tower gallery in an exhibit titled “Super America”. The exhibit opens June 1 and runs through to July 1. 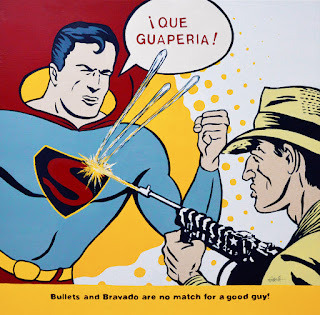 The exhibition is populated by iconic superheroes, atomic age monsters, and cinema icons—all portrayed in re-imagined ways with a bilingual context— and asks who has been the traditional hero or heroine of our stories and who gets to be the main character today. Ric Garcia sees his appropriation of American cultural images as a meditation on identity. "I infuse my art with references to various mythos, focusing on hero worship, Latino and gender cultures, creating images about Americana filtered by my bi-cultural experience," Garcia says. Barbara Januszkiewicz's two solos at once! 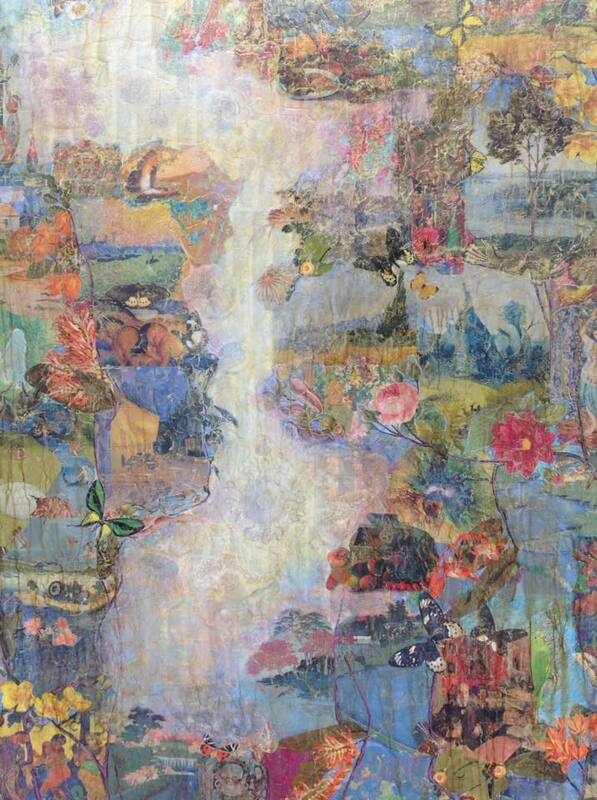 Not one, but two solo shows opening up at the same time for DMV artist Barbara Januszkiewicz. The Nitty Gritty at the Art Club of Washington will be displaying mostly works on paper appropriately name after her musical muses. Each work is titled from a song from the late 60s early 70s, with an “ip” in front of it. Januszkiewicz explained the ip means inspired by. This painter has taken her love for watercolors and has been able to reinvent acrylics in a new way. Philosophically, Januszkiewicz values risk taking, experimentation, and creative collaboration which lead to Washington Color Painter Paul Reed encouraging Januszkiewicz to experiment with staining with acrylics. She has mastered this technique that offers the luminosity of watercolors, but with the nitty-gritty texture that only acrylics could offer. Also in this exhibit are some fine examples of her works on unprimed canvas using the same technique. What is astonishing is to witness her able to stain the unprimed canvas in the same manner as she paints on paper. This is not an easy task. "Music is my muse," she continues. "I am inspired by the gritty undertones and rhythm patterns of the Blues and Rock. I take the basic structure of a song’s chord progressions and play with the idea of a building a cord in the colors that I paint with. Blending the music and corresponding color notes, I work to create luminous paintings that reflect the emotionalism and improvisational freedom that we find in music genres. I see my work as a frozen moment of the song." Across town at Martha Spak Gallery at the Wharf, Januszkiewicz is showing a group she calls Acoustic Fields. The artists explains that these are mostly large works, both on unprimed canvas and metal with resin. Clearly her fascination for color reminds us of Mark Rothko’s Color Fields with her effortlessly produced zen-like brush strokes across her canvas. Yet she is giving us something new and perhaps even changing our perception of the future of contemporary abstraction. "I find it intriguing that there is a vocabulary of words that apply to both music and visual art, like movement, patterns, compliments, harmonies and layering," she says. These paintings from the intense color compositions to subdued shades of reverberations can visually suggest the sensation of sound. I am thrilled to inform you that the American University Museum has been chosen as the recipient of nearly 9,000 works of art from the Corcoran Art Collection. If you have not seen last week’s announcement in the Washington Post, please see it here. We plan to use this once-in-a-lifetime gift to establish The Corcoran Legacy Collection at American University. To give you a taste of this new collection, it contains some of history’s most masterful artists such as the 16th-century Italian painter Titian, American artists Ansel Adams and Helen Frankenthaler; 18th-century British portraitist Thomas Gainsborough, as well as important American collections such as those of William A. Clark and Olga Hirshhorn. In the spirit of our Alper Initiative for Washington art, we are very excited to expand upon our collection of 19th-century Washington art, with works from the Washington Color School and paintings by figurative artists such as Sarah Baker, Manon Cleary, and Claudia DeMonte. The gift will also supplement our collection of work by female artists and artists of color, in alignment with the legacy of the American University Art History department as a leader in feminist art history and the university’s commitment to diversity and inclusion. 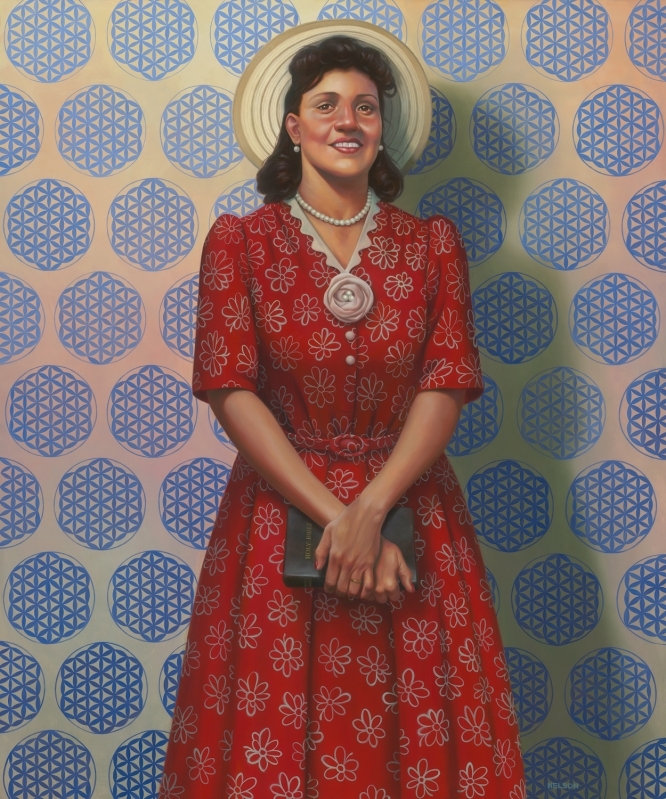 For those who are curious, you may view the complete listing of artwork and recipient organizations in the Corcoran’s May 14th press release here. In order to prepare for the legacy collection at AU, the university has invested in a new storage facility that will be a home to works utilized most often by the museum, complete with rolling racks and shelving. We have also upgraded our collections management software and will be working with the registrars at the National Gallery of Art to incorporate the data on the new collection. With every great collection comes great responsibility. We still have much work to do! American University is seeking support through a funding initiative designed to further expand our storage capacity, enhance the museum’s exhibition space to accommodate the growing collection, and safeguard the Corcoran legacy for the greater arts community. We also aspire to create a collection viewing and study room to provide increased accessibility to scholars and visitors and new faculty and staff positions to care for the collection and ensure it is shared with the world through public program offerings. We will continue to update you as this project progresses and look forward to celebrating this transformational milestone with you! 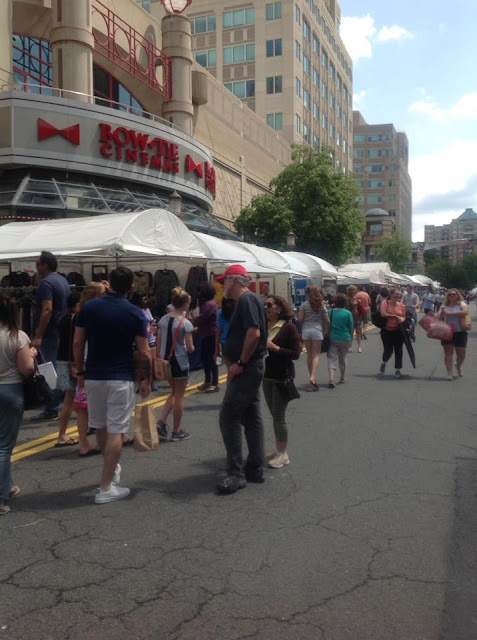 Sunny in Reston for the art fair! Hatfield was selected from more than 150 applicants as part of Target Gallery’s annual Open Call for a Solo Exhibition. Jurors were: Jarvis DuBois, independent curator; Carolina Mayorga, D.C.-based artist; and Victoria Reis, co-founder and executive director of Transformer. “I was immediately drawn to Caroline's very sophisticated and thoughtful use of materials to convey concepts of utopia and science fiction,” said Reis. “Caroline adeptly conveys an otherworldly experience that completely draws in audiences, taking us on a journey that is both wondrous and confounding. Their innovative re-contextualizing of current environmental circumstances through beautiful yet haunting installations provides an important and engaging viewpoint to our relationships with land uses and our evaporating natural resources." Caroline Hatfield: Unearthing runs Friday, May 25, through Sunday, July 15, 2018. The opening reception will be Friday, May 25th, 7 – 9 pm, with Hatfield’s comments at 8 pm. Target Gallery will host a second reception and juror talk on Friday, June 15 at 8 pm, as a part of the Torpedo Factory Art Center’s monthly Late Shift event. Target Gallery is open daily from 10 – 6 pm and until 9 pm on Thursdays. and represented locally by Zenith Gallery! The annual Northern Virginia Fine Arts Festival returns for its 27th year with some exciting updates! Balducci's Food Lovers Market joins this year as Title Sponsor; Festival Friday kicks off the weekend of activity; and the Festival Party is on Saturday night. Some things, of course, remain constant: the quality of the 200+ artists from 35 states; the enthusiasm of our fantastic crowds (typically averaging 30,000+); the phenomenal support of our sponsors; and the invaluable contributions of our nearly 300 volunteers. This dweeb keeps trying to rip off artists by sending the same email with different originator emai address - don't fall for it! A written trademark assignment filed with the US Patent and Trademark Office in 2007 and obtained by The Art Newspaper seems to bear this out. Designating Kahlo as the assignor, represented by Pinedo through power of attorney, and the Frida Kahlo Corporation as the assignee, it transfers “full and exclusive rights, titles and interests” for a slew of trademarks for the name “Frida Kahlo” as well as the phrase “Pasion por la vida” (a passion for life) and Frida Kahlo-branded tequila. “It is expressly agreed and understood that if The Assignee is the owner of any other trademark application that includes the denomination ‘FRIDA KAHLO’, the instant agreement includes it,” the filing states. Read the Art Newspaper article on the commodification of the Frida Kahlo trademark here. The Corcoran Gallery of Art, one of the first private museums in the United States, was established in 1869 and expanded in 1880 to include the Corcoran College of Art and Design. The Corcoran Gallery of Art has closed, and in 2014, the Corcoran transferred the college to George Washington University. A complete listing of artwork and recipient organizations can be found on the Corcoran website at corcoran.org/artdistribution. Read the whole article in Artwork Archive here. Still this guy tries to rip off artists! Be aware! This is a scam! Im Thomas Fred From NC. I observed my wife has been viewing your website on my laptop and i guess she likes your piece of art work, I'm also impressed to have seen your different piece of works too, : ) You are doing an amazing job.I would like to receive more information about your piece of artwork and what inspires you. I am very much interested in buying a piece of art ,to surprise my wife. Kindly reply for the immediate art work for purchase ?? Detailed entry guidelines are available at hocoarts.submittable.com/submit/, for pick-up at the Howard County Center for the Arts, or by mail by calling 410-313-2787 or emailing info@hocoarts.org. The next deadline for submissions is Sunday, July 1, 2018.